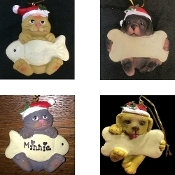 Adorable Pet Gift Ornaments, heavyweight poly resin fully dimensional hand painted Dog with Bone or Cat with fish, each adorned with a classic holiday red Santa Cap, with metallic gold string hanger. You choose PLAIN or option for *Free Personalization. Also makes a unique DIY crafts project to decorate with your own permanent or paint marker, sequins, stickers, rhinestones or other embellishment! Choose PUPPY DOG in Dark Brown or Golden Yellow, or KITTY CAT in Gray or Tan. Size: Each approx 3-inch High x 2.75-inch Wide x 1.25-inch Thick.